Jameis Winston vs Marcus Mariota: Three years in, who has the edge? The Jameis Winston vs Marcus Mariota debate started before the 2015 NFL Draft, and will carry on throughout both respective player’s career as both players now head in to their fourth season in the NFL. The former top two picks have not underperformed, but neither has performed with the level of consistency to be considered among the top 10 quarterbacks entering 2018. Expectations have never been higher for both signal-callers to be able to carry their respective teams when needed. With a three-year sample size, who has performed better up to this point? Finding the differences in their respective games is clear, but when you piece it all together, there has not been much separation from these two quarterbacks. We take a look at their overall grades, and their play in key situations. After three seasons, both quarterbacks hold the exact same PFF grade of 71.1, sitting tied for 18th out of 36 qualifying quarterbacks from 2015-2017 (minimum of 500 pass attempts). While doing it in a different ways stylistically, they both find themselves as Tier 2, Cluster 3 quarterbacks. 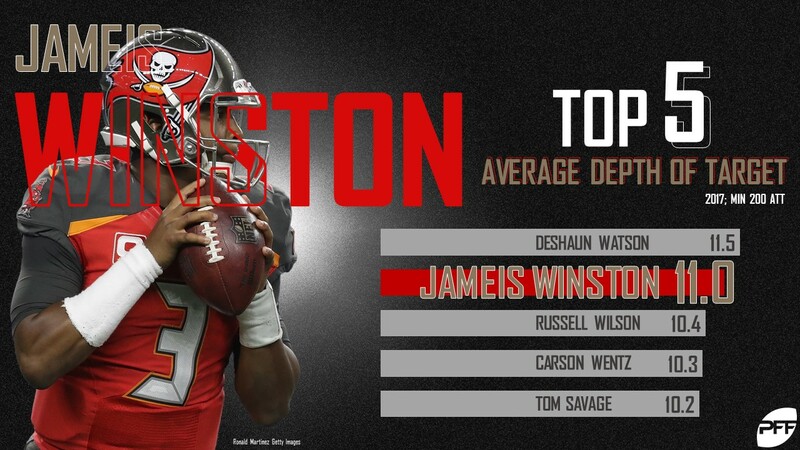 Both quarterbacks in their first three seasons have shown they play aggressively and not afraid to let it go down the field, with Winston’s 10.7 average depth of target ranking first over that span, and Mariota’s 9.7 being tied for seventh. While constructing the grade comes from all angles, a good amount of their work is done targeting the 10-19 yard range of the field, and it’s clear this is where both player are at their best. Winston has attempted the most passes (by over 100 to the next competitor) and seen the most yards in NFL at the 10-19 yard range since 2015 (4,959 yards). He’s one of the better anticipators in the NFL, and has always shown the ability to throw up and over underneath defenders to find completions in tight windows in this part of the field. Conversely, he has the most turnover-worthy plays and interceptions (21) in this area of the field, often trusting his pre-snap read and the design of the play based on the defensive look too often. Mariota has been slightly safer at the 10-19 area of the field, and holds a top 10 grade in the NFL over his career span. Mariota tends to throw with a flatter trajectory, and is far more of a window thrower, but we’ve seen he can be deadly spotting a window to find crossers and in routes at the intermediate part of the field.